Two Feet or not Two Feet? Decided to go through my older figures and put feet on the ones that I could put feet on, and otherwise touch them up construction wise to be consistent with my new style. Some I can't change much, but most I should be able to "update." Here are four monsters and four PCs that I updated. 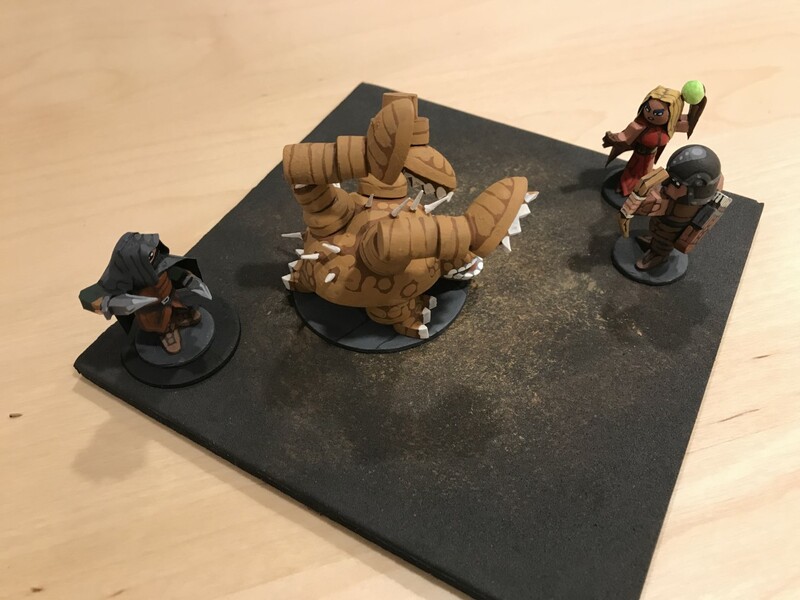 I just added feet to the umber hulk, iron golem, and flesh golem. The troll also got a paper "skirt" and paper hair. I like him much better than before. I unfortunately could not put a paper skirt on the flesh golem. I wanted to, but the way his arms are makes it impossible to put one on him, so I just stuck with the painted on pants. 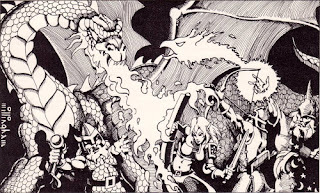 One of my first PC figures was the cleric on the left. He looks great with his new feet I think. The next one is just a generic fighter, and then the ranger next to him, and finally the Erol Otus tribute fighter. 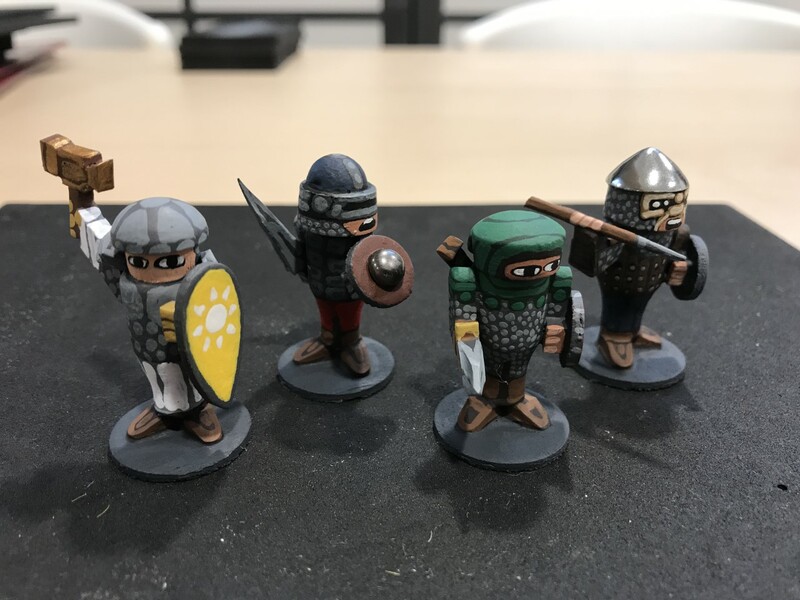 These all were a little "iffy" for me at first because none of them have, or could have given where their arms are, the paper tunic or armor that hangs down a little lower than their waist. So I was a little worried that the feet would make the figures look funny, but I like them much better with feet than without them. I've been working on a set of retro-inspired (not a "clone" set per se) fantasy tabletop rpg rules and I needed to have some way on the tabletop to indicate that a character who can hide and sneak is doing so successfully ... to use an old-school term, is "in shadows." Finally dawned on me how to do this simply. 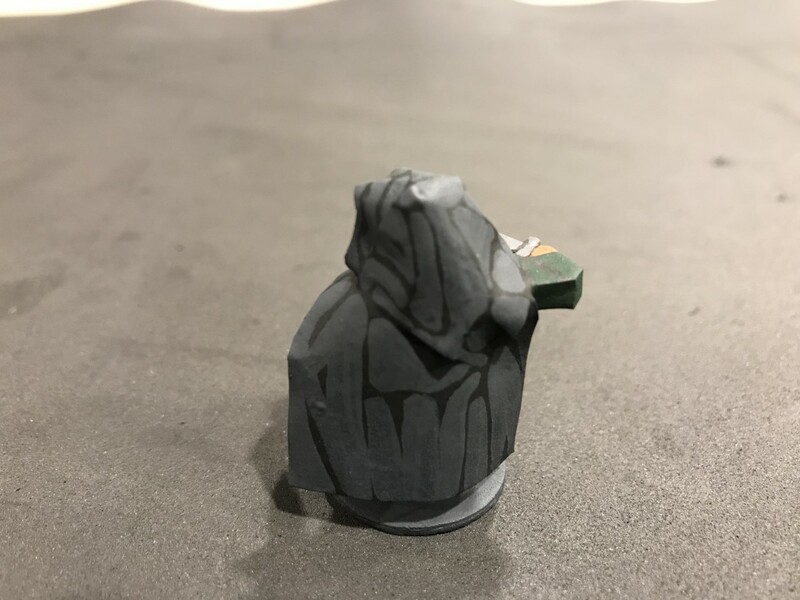 I just took one of the larger round wooden pre-cut bases and painted it black. During play, when a character successfully is stealthy, I put the figure for the character who is stealthy on top of the black circle. Let's everyone know that character is "in shadows" and cannot be seen by enemies. 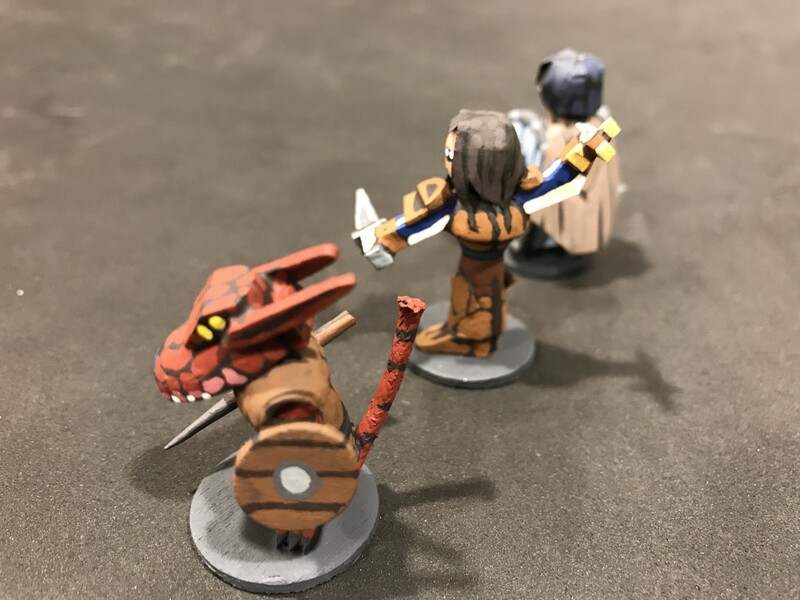 The fighter and the magic-user engage the otyugh to its front, while the thief sneaks around for a backstab. 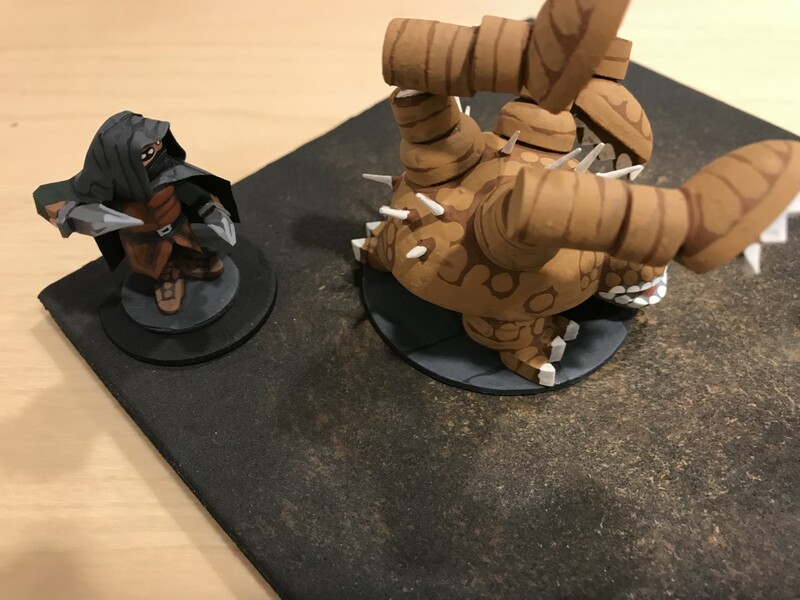 The large black base that he is standing on indicates that he was successful in his stealth attempt and will be able to backstab the otyugh next round. Close up shot. Yep, simple is usually best. 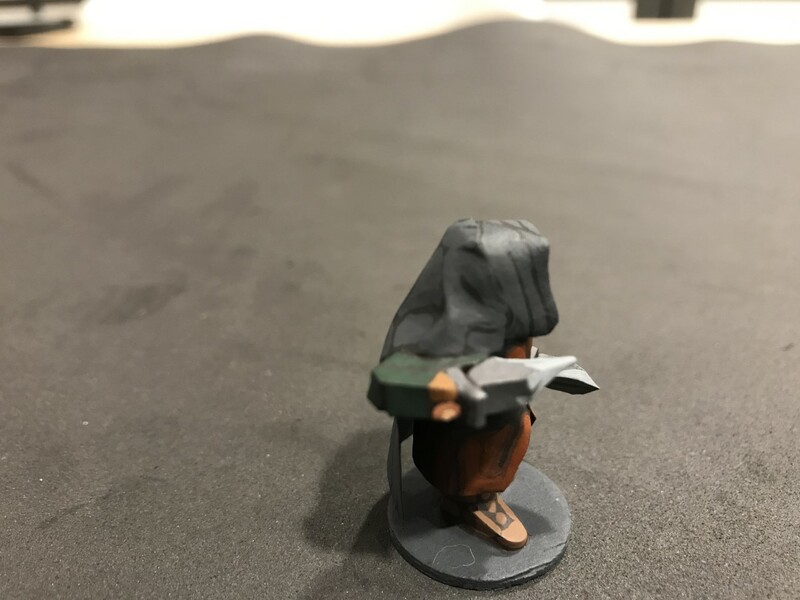 Also beats the heck out of doing a completely new figure painted in some way to represent that he is stealthy (sort of like what I did for Frodo in painting an "invisible" version of the Frodo miniature). These pictures also have one of my new room tiles in them as well. Also simple. 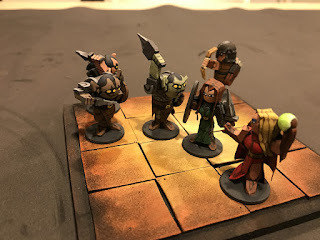 I decided that 1) the floors in a dungeon should be pretty dark, so I need to allow more of the black of the foam or the darkest color (in this case dark brown) to show through with less of the light color showing through to make it look appropriately dark, and 2) by keeping the color on the tile fairly muted, it allows the figures to stand out more and people will pay more attention to them, which is what I want. 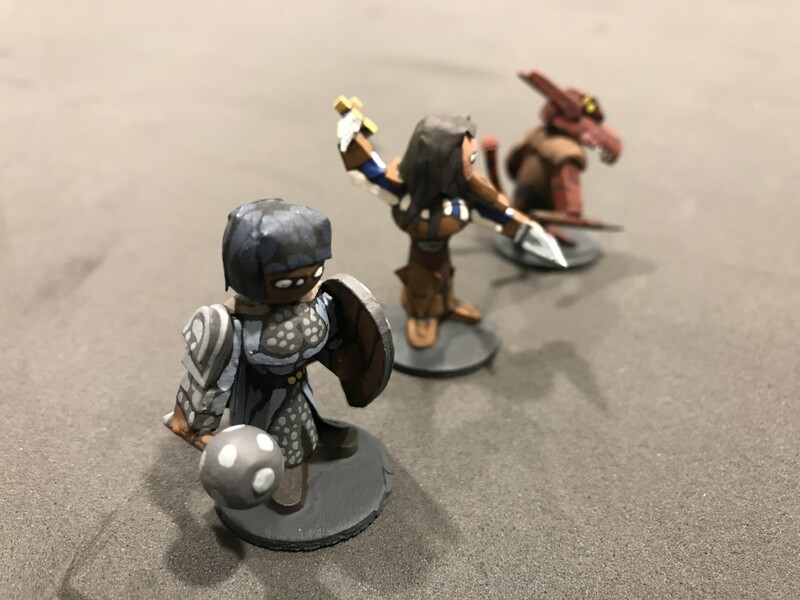 Just finished up two more female PC figures, a cleric and a rogue, and a prototype kobold figure. 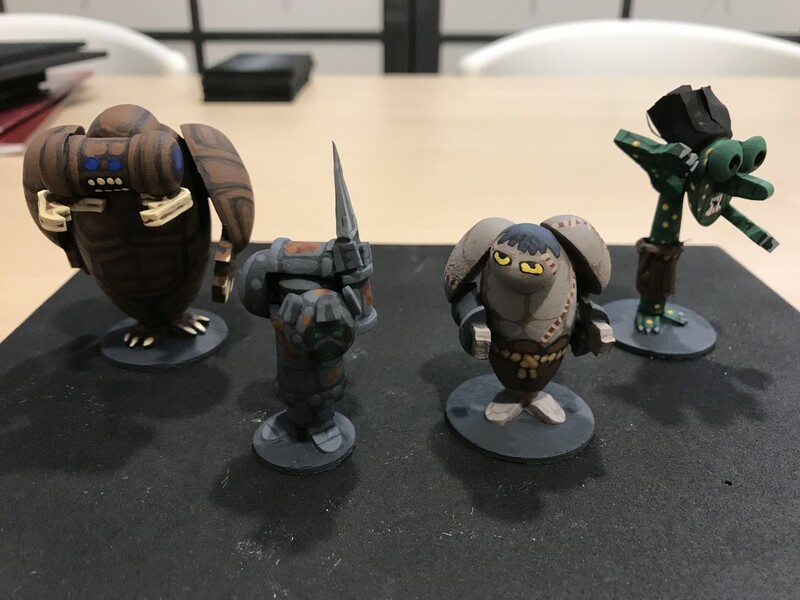 Whenever I do a new monster of any type, unless I am 100% sure about construction, I always do a single prototype figure so as not to waste produce when I screw it up ... and I will screw it up! This kobold is actually the second one I did, the first one didn't even get painted I disliked it so much. So we have the female cleric on the left, the female rogue in the middle, and the kobold prototype on the right. First the PCs. I wanted to do something a little different with their hair this time. I definitely wanted a "page boy" cut on the cleric (seems pious to me for some reason! ), and for the rogue I wanted to try giving her short bangs. I'm happy with both the hair styles. Other than that, there is nothing new in the construction of the female PC figures this time, just different hair. Oh, there is one thing, I tried (somewhat successfully?) to give the female rogue more flared boots using a piece of paper cut into a long diamond shape for the front of each boot, and then flaring out the left and right points of the diamond after it was glued onto the shaker peg to make it look like, for lack of a better term, "pirate boots." 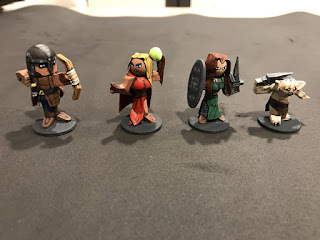 It was somewhat successful, I think I needed to make it more exaggerated than I did (another "lesson" I've learned about these fantasy figures, the more over the top, usually the better it looks). But for a first effort, not bad. You can sort of see the boots in the picture above. The kobold I give about a grade of B. Some of the things I like, some not so much. 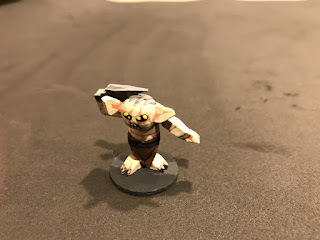 He's made just like the Goblin Town goblin I just posted about last week except that his head is obviously a split oval bead rather than a round one. I used a cut tile spacer to make his "crest" on his head. The ears are just the pointy ends of pre-cut long, thin, flat, pointed on one end, wooden shapes you can get at any craft store. One of my issues with him is that he is too big to be a kobold, but with these guys I don't worry too much about size and scale. The other issue I have with him is I think I can do better with the crest on the head. The cleric's mace is just a small bead glued onto a toothpick and trimmed. I like that it's so oversized, makes her look like she clearly must have the strength of her god running through her to be able to wield a weapon like that! And now for the battle in the hallway pictures just for fun! These are new foam terrain pieces I've been working on (very simple, nothing to them) with the newer figures I have done battling it out in the hallway. The female fighter/paladin went ahead of the party and got surprised by a kobold and a bunch of orcs. She has been somewhat isolated but the rest of the party rushes down the hall to help her. 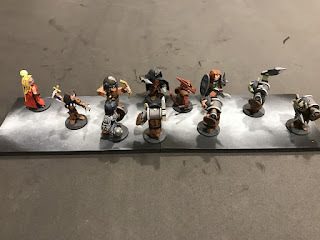 The male rogue is hiding in the shadows, getting ready to backstab the kobold, while the other members of the party move into a melee position or provide ranged attack support while some of the orcs continue to close. Newest Heroes and a Goblin! 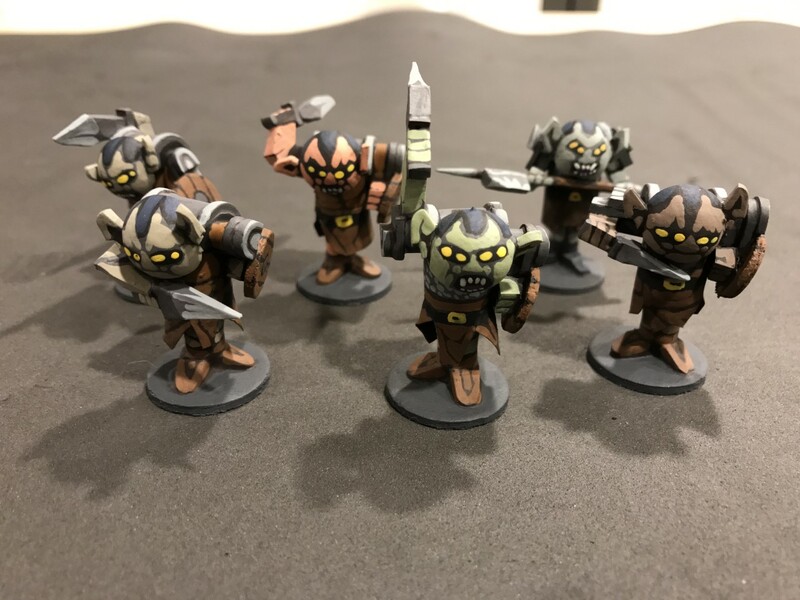 The latest batch of figures I finished is a new goblin construction, and some further attempts to use paper in more creative ways. Also, I am happy to say, I have finally hit upon a construction for female figures that I like. So, here is a Goblin Town goblin from the Hobbit (which is a slightly different construction than my Moria goblins), with three figures all from the artwork of my favorite version of D&D, Moldvay's Basic game from 1980 (or maybe it's 1981, I can never remember). 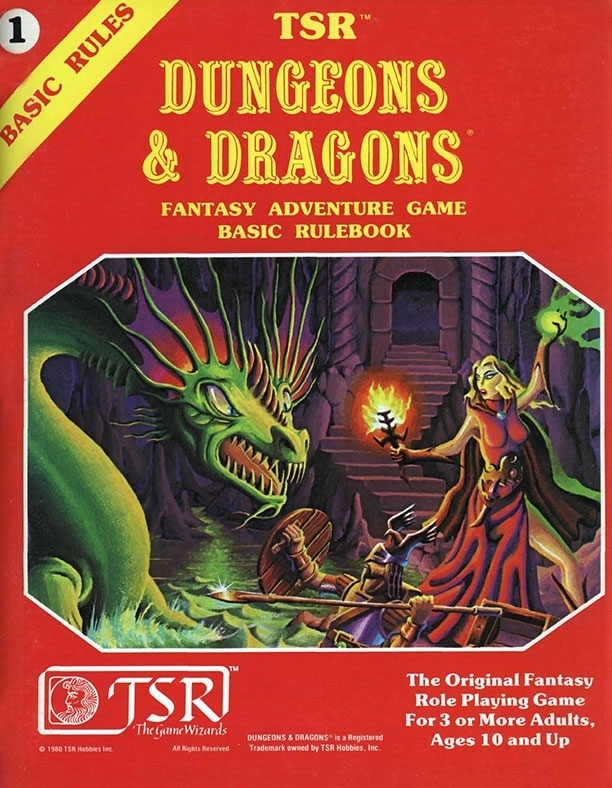 The female magic-user in red is from the cover art, the female fighter in green is based on a female elf character from the first page of the book, as is the human male archer (also from that first page). I'll start with the goblin. 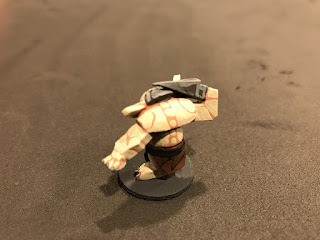 He is constructed slightly differently than the Moria ones I just finished, plus I put a paper loin cloth on him rather than painting his clothing on him. His head and arms and feet are the same more or less as the Moria goblins, but his body is a bead tapered at each end, with his shoulders made from the same type of bead but split in half lengthways. You can see it a little better in the pictures below. He ends up being about the same height as the other goblins, but he's not as "stout" and given that he is supposed to be unarmored, this is a better construction for these types of goblins. I'm not thrilled with the paint job, but this was really just a test figure to see if the new construction could work, and I think for future figures, including non-goblins, it might work out pretty well. I am pretty pleased with these new PC figures. I have never liked the way I have done female figures in the past because a) the general "form" of the milk bottle is ... let's just say ... narrow in places where it should be wide, and wide in places where it should be narrow, and b) with the volumes of hair that these fantasy figures often have, just painting the hair flat onto the figure just doesn't work that well. 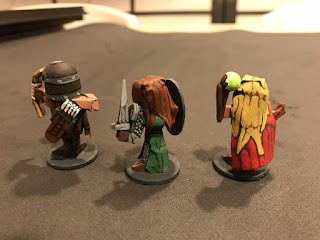 So I decided to use a different collection of wooden pieces to create the body, and to see if I could create hair for female figures using paper. I'm pretty pleased with the outcome. Both female figures are made with a shaker peg with the peg part cut off the bottom. This creates the body from the ankles to the neck. Then I glued a small round bead on top of the rounded part of the shaker peg, creating the head. The feet are just tile spacers like I have done for all the human figures I've been doing of late, as are the arms. The hair is just strips of paper cut to shape and glued onto the head. I like the shape of these figures for female figures much better than the milk bottle construction. 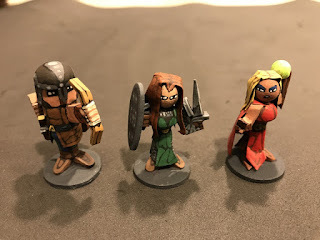 As you can see, I didn't put either of these figures in a "chainmail bikini," but I do think that the shaker peg gives a better basic female form than does the milk bottle construction. It is pretty obvious I think in looking at them that they are females, and at the same time the figures are not too small compared to the milk bottle construction. I'm a bit more pleased with the fighter in the green than the magic-user in red (I made her right arm a little too long, but oh well), but they all came out pretty good I think, and I am very pleased with the basic construction, paper hair, and paper cloaks and coats. 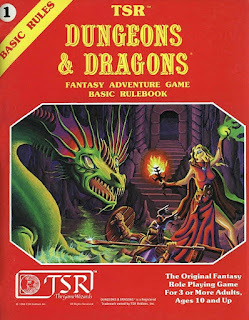 The magic ball is nothing more than a very small wooden ball glued to the tile spacer arm and painted white first, then I used florescent green paint to match what is on the cover of Moldvay's Basic D&D book as best as I could. For those of you who are interested, here are the drawings from which these figures were inspired. And now, for the all-important action shot! 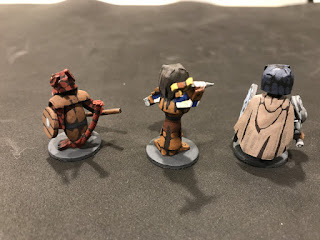 After more or less finishing the Balin's Tomb project (the game is scheduled for June 25th, I will post pictures and a battle report here afterwards), I'm back to doing some classic D&D figures. One of the things I have noticed in doing these wooden miniatures now for several years is that you end up improving them, and I don't just mean the paint jobs. You end up doing more with the construction as well, and the improvements tend to "out date" your old figures. Another way to think of that is that the newer way of doing the figures makes the old way obsolete. This is a challenge on many levels, but the biggest one is not wanting to redo figures because you will be happier with your new way of doing them compared to the old way. But of course, that is going to happen. Also, it can be tough using the new and the old figures together in a game because of the stark contrast between the figures. A good example of this is looking at the posts where I show the LotR figures I did 2 years ago compared to the ones I just did. 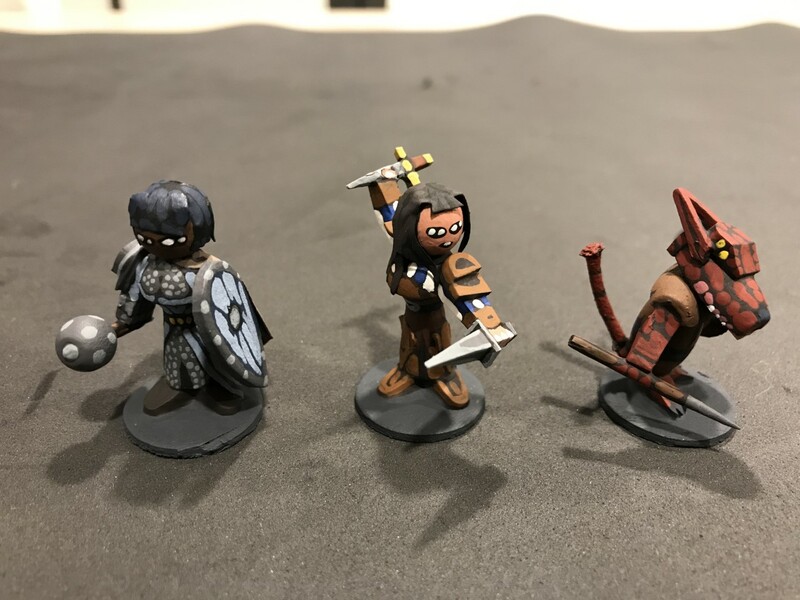 They would just look funny together on a game table, sort of like putting an old Grenadier or Heritage fantasy miniature that you painted when you were 12 on the gaming table with a brand new Reaper fantasy miniature that you painted at 50. You can certainly do it, and there is nothing "wrong" with doing that, but it does look a little odd. Same thing happens with these wooden guys, so I decided that I would continue my efforts refocusing on classic D&D monsters, and some new player character figures. The good news is that some of the monsters are not really affected by this. The Otyugh is a good example, he will stand the test of time most likely. But the player character figures in particular will not. 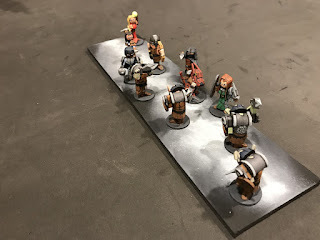 I've already posted the test figure for this, but I did 5 more orcs with my new construction process to give me an even half dozen new style orcs. The milk bottle construction does limit the poses somewhat with the feet always having to be positioned this way, but that is less of a limiting factor than the way I'm dong the heads (split larger bead with tile spacer ears). Even with those limitations, I really like the construction on these guys. The heads are rounder than when I use the axle cap (which tends to be flatter) and the half-holes created by splitting the bead create in some cases small holes to insert the ears into for even more strength when gluing. The ears themselves really give these figures (and the goblins too) an "orcish" feel to me, making them look noticeably different than a human or elf figure. I even changed the paint scheme a bit on the faces to make them look more consistent and to create some facial creases around the mouth, and I painted a suggestion of a nose as well. The "skirts" are just paper like I've been doing, and I continue to be amazed at how much "movement" the paper puts into the figure's appearance. So construction is just a milk bottle body, tile spacer feet, split bead head, tile spacer ears, split spool shoulders, tile spacer arms and weapons and shoulder armor, and small wooden thin precut wooden circles for shields and bases. I will eventually do 6 more to give me an even dozen, probably with more varied melee weapons. 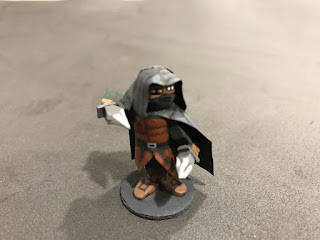 I've been trying to embrace doing more figures with cloaks so that I can get better at doing them. 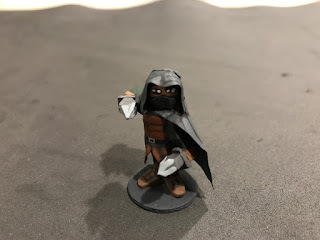 So, for my new PC figure I decided to do an old school thief. His construction is nothing new per se. Milk bottle body, tile spacer feet, tile spacer arms and weapons, small bead for a head. The leather armor is just a paper "skirt" that I put on where the milk bottle starts to taper, just like I did with the Aragorn, Boromir, and Legolas figures from the Balin's Tomb project. The tricky part of this figure without question was the cloak, especially the hood piece. For the cloak, the first thing I did was glue the large part covering his back onto the figure. This was not difficult, just cut it to fit, got a shape I liked, it was fine. In the future I may try to actually do more folds in it, rather than painting the folds on. The hood is what took me about a week to figure out how to do. I was trying to do it in one piece, but I couldn't get the "darts" (for those of you who do not sew, these are the angle cuts in fabric that allow you to create things like pleats in pants) to work right with the paper. And it was just too hard to control as one large piece. I must have cut 20 different versions but because the single piece was so hard to control, I could never pull the trigger to start gluing it on the figure. I just didn't have the confidence that I could control the relatively large "hood" piece of paper through all the steps necessary to glue it to get it to look right. What I did instead was create three strips that I used to make the hood. These strips run from the figure's left side to right side (not front side to back side) and this allowed me to easily create the folds around the face (as one piece), then a middle piece, and finally the back piece ending in a point down his back. The paper still has to be folded to conform to the hood shape, but since the pieces themselves are much thinner/smaller, this was easier to do. And, because you are gluing paper to paper in most cases, or paper to the flat side/top of a bead (the head), the drying process for the glue was a piece of cake, I never had to go back and reattach any part of it or anything. Then it was just a matter of painting the cloak's folds. 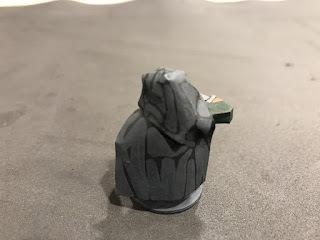 I did what I normally never do with these figures and used a black base coat for the cloak (I prefer a dark brown, it's much "softer" and doesn't look so harsh) and then painted the dark gray color over the black leaving some showing through to produce the suggestion of folds. I actually glued the mask piece, which is just another piece of paper, onto the face after I put the hood on. I thought this might have been a mistake, and it was a little fiddly I admit, but I think it turned out better this way because I new exactly how wide the mask was going to need to be given the opening in the hood. Had I done the mask first, I obviously would not have known that. All in all, I'm pretty happy with the figure. I'm sure I'll get better down the road at the cloaks and make another cloaked thief figure, but for now, this one works just fine.